Calamari, when made well, has got to be one of my favorite appetizers. However please hold the tomato sauce…blech! Don’t get me wrong…I love me some tomato sauce but not with crispy calamari. That I reserve for things like this Sicilian Calamari – that…works! I would much rather have a spicy remoulade or a thin sweet and spicy sauce. One thing about calamari at home is the endless small-batch baskets going into fryer, plus the oil smell. I just finished reviewing and testing out the new Avalon Bay Air Fryer from Air & Water which is a compact “egg-shaped” small appliance that uses rapid air technology and a heating element to cook your food faster and lends food a fried taste without oil. Its an interesting machine, especially when trying to be a bit healthier and cutting down on fats and oils…like many of us are trying to do this time of year. I like the sleek design as well as how compact it is. I LOVE the fact that the Air Fryer has a handle built in right on top. Its fantastic, making it so easy to move it around. Even the box had a handle…very well thought out. The second thing I adore is the timer. Its easy to use, dings and shuts off when finished. It shuts off by itself! Yeah for all those times I get distracted watching Downton Abbey, errr I mean doing homework with the kids. This is especially useful, in my opinion, for those that often cook for one and it would be awesome for college dorms. You pop in what you want into the basket, give it a shake or two in the middle of cooking…and ding…its done! In my opinion this acts more like an oven, and bakes things father than a fryer. However, a tiny brush of oil to the skin of chicken for example, give a more fry-like result. I have been tinkering, and there is a bit of a learning curve with the rapid air technology air fryers use. Between my tinkering as well as the other 8 food bloggers involved, in addition to the recipes shared below successes include air fryer chicken legs, chicken wings (which my daughter deemed “the best I ever had in MY life”, “baked” potatoes, including sweet potatoes, freshly made fish sticks and avocado fries. We had some fails as well, such as fried rice (that really needs oil), chips & pita chips but now I/we seem to have found the groove. When it comes to using a flour coating on things, they seem a bit dry, however, I fixed that by tossing the calamari in a delicious sauce them crisping them up again in the fryer. I was determined to find a way to enjoy calamari the feeling of enjoying fried calamari without the fry and in the end it worked out. Check out Air & Water’s Facebook Page for more of their exciting products. Good News! 2 of you will have the chance to win one of these Avalon Bay Air Fryers for your own! I received a fryer for my review to test out, all opinions about the fryer are my own. Rinse your calamari clean and blot dry. Slice the calamari tubes into rings about 1/4 inch wide. Place the calamari rings into a bowl and cover them with the club soda, stir until all are submerged. Let sit for 10 minutes. Meanwhile combine the flour, salt, red & black pepper. Set aside. Drain the calamari, blot dry. Dredge the calamari, one at a time, in the flour mixture and set on a plate until ready to air fry. Once ready to cook. Spray the basket of the fryer with a small amount of cooking spray. Place calamari into the basket, careful not to crowd too much, set temperature for 375 degrees and set the timer for 11 minutes. Shake the basket twice during the cooking process, loosening any rings that stick. Remove from basket, toss with the sauce and return to the fryer for 2 minutes more. Serve with additional sauce if you like. Make sauce by combining honey, sriracha and red pepper flakes in a small bowl, mix until fully combined. Looove me some calamari! And the sweet & spicy sauce sounds great! This looks amazing! I love calamari but have never made it myself! I would love to try making fries or onion rings with this! I'd make some yummy french fries since I just got a french fry cutter for Christmas! I'd make some fries & cheese sticks in this! Giiiiiiiiirl!!! I need an air fryer in my life!!! I love your calamari recipe and you know I'll try my best to air fry donuts if I won one. Yeah. I said it. Yes!! One of the ladies did a Nutella Pie! Whoop! Yes, to the avocado fries and calamari!! Two of my favorite recipes that I try to avoid because of the oil! I would be all over those recipes! I love the idea of this, can't wait to try it. I'd love to try making fries with it! I'm not a huge calamari fan, but I do love fried food lol! I'd make onion rings and fried jalapeno rings! I think this sounds like a neat concept. Fries would be tops on my list! Looks amazing, I'd love one if these!! I would love to try one of these. I would do onion straws first. We use them from salads, sandwiches, on pizzas, burgers, etc. with all different types of seasoning. I would love to make the Nutella Apple pie, there are so many things I could make. I love love love calamari !!!!! I've always been too chicken to try to make it myself though, I really need to try though, you make it look so easy! I'm intrigued!! I've never seen this before, but as I don't actually "fry" because of the high oil content, this is something totally on my list! I love everything deep fried! especially onion rings. I think I might try to fry some shrimp. Wow—I have never even thought of making calamari at home! I think I might be more likely to try shrimp–maybe using a similar technique. I would love to make Chicken Nuggets for my Grandson! What amazing technology! I'd be making a ton of onion rings first thing! Recipe looks yummy! 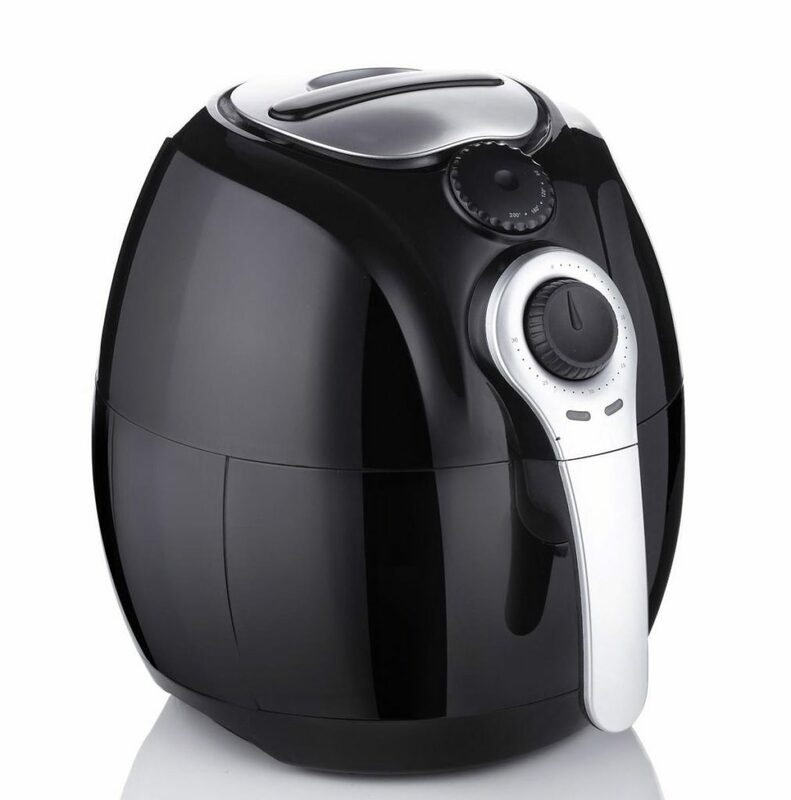 I would like to try Potato wedges with this Air fryer.. This recipe looks delicious. I'd love to try Fried Ravioli's in an air fryer! They're my favorite! The recipe and pictures are making my mouth water. The concept of an air fryer sounds really interesting! Would love to have an air fryer for my kitchen. Thanks for the opportunity. O my goodness!!! This recipe makes my mouth water!!! Honey and siracha???!!! What an amazing combination! i would start with 'fried' shrimp and 'fried' onion rings. SO MUCH! Chicken, shrimp, anything! The recipe sounds amazing and so do the Avocado fries. I would use it for Chicken and fish mostly. I'd like to play around with my husband's onion ring recipe! I love them but they're so messy when fried in oil! those drumsticks sound amazing. I've only had calamari once and that was in NY, but if that was good this has to be amazing! I'd have to try a different recipe because I can't have spicy any more, but it all sounds so good! I think this recipe looks amazing and I can't wait to try it! I think I would also try to do some type of onion ring. I LOVE onion rings! I would make sweet potato fries in this! i would try french fries! I would try to cook some sweet potato fries! Thanks! Since we are not calamari fans here, I think I would try onion rings first. I'd love to try french fries in this air fryer. This is a great invention; it not only is much healthier than cooking in oil but saves the cost of the oil. Then, for it to cook in half the time, who wouldn't want one of these? Thank you for sharing and for your giveaway! I will check out your other recipes. I'd do fried sage, leek frizzles, sweet potato fries! I would first try onion rings, love those. This is such an interesting new fryer. I love calamari but I eat mine without sauce. Had some for lunch today. I have never had calamari and do not want to try it. So, the recipe did not appeal to me. Sweet potato fries or regular fries would be good to try with this cooker. It looks good but I would not eat calamari. I would try fish & chips first. The Philly Cheese steak Eggrolls sound really good…I would try them! I love calamari but I would love to try some catfish nuggets. Not sure about the recipes, but I would cook everything I normally cook in my deep fryer in the air fryer if possible. This is awesome! I would have to make fish and chips,chicken fingers,and shrimp and scallops, I'm getting too excited to cook in this,my mind is just going in all sorts food directions! battered zucchini yum!!! We have stopped eating fried foods because I want my family to eat healthy. We miss certain foods like fries, etc. This would be an awesome way to be able to eat the things we miss without the grease. I crave onion rings all the time so I'd make those but those avocado fries would hit the spot too. In my home we do fry food a lot, chicken tofu, potatoes. Maybe we can cut don't on eating oil with this if the flavor and texture is the same. I would like to try onion rings, french fries, sweet potato fries, zucchini sticks, fish sticks, chicken fingers, and I am wondering if it would do my frozen breaded okra without deep frying? Philly cheese steak lools yummy but so do most of the recipes. This would be great, I would make "fried" chicken first. I would cook battered fries! 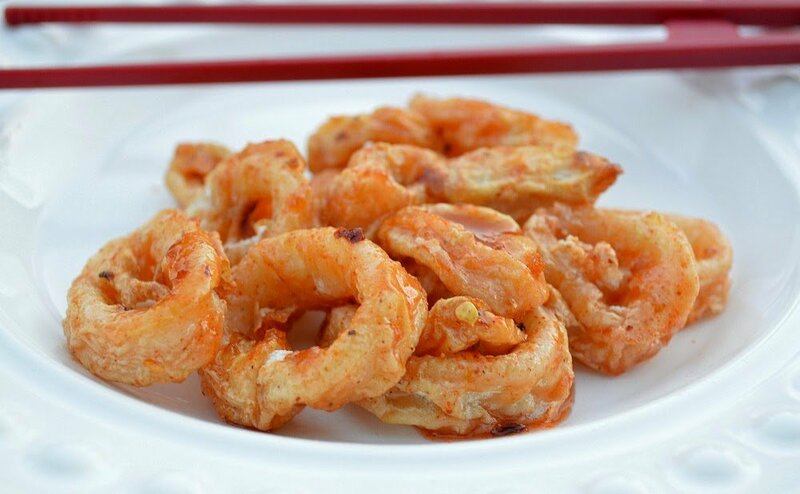 The calamari recipe looks interesting, but my family loves to eat Tempura shrimp and vegetables every holiday! It leaves our house smelling like a greasy spoon restaurant, and all that oil can't be good for us! I would love to try Tempura in the Avalon Bay Air Fryer! I would try the Calamari !! I love calamari and this sounds so good! Would love to fry up some shrimp and fries in one of these! What a neat concept! I would like to fry up some wings, shrimp, whatever I can get my hands on! I'd love to cook chicken strips and fries in this fryer! I would make oil-less french fries and onion rings. I would love to try making calamari in this. I would like to try the calamari. I would try onion rings! This would be perfect for chicken parmesan. I love the handle and the design of this fryer! This would be so handy in the kitchen. Especially when feeding teenagers! Honey Tossed Calamari sounds wonderful! So do the avocado fries…I love putting fried avocado on tacos! I would make fried peppers!! I would make potatoes. Thank you for the chance to win. First thing I would cook is chicken. I would make some seafood in the fryer. Pretty sure we'll be trying this recipe stat! YUM! I love sriracha! Oh and the avocado slices…those are a favorite in our house. Can't wait to air fry them. i would fry alot of things in there starting with calamari but I have no idea how to enter this? there's no entry form, no rafflecopter, nothing to click on.. HELP! The recipe looks amazing and I would definitely try it. Anything with sriracha makes my mouth water! I'd love to try this recipe. I've never seen or heard of an air fryer before, but it looks interesting. I'd love to try it and see if it actually works because it would be great for healthier foods. I'd try sweet potato fries first. I would probably try out some fries first. I would definitely make some wings and fries. I'd like to make sweet potato fries! I would love to air fry some veggies…some zucchini, some broccoli bites, some eggplant! I would try to fry some fish in the air fryer. Thank you. Love calamari. Have to try this recipe. I would make fries and chicken. Also some veggies. Thanks. I'd definitely make zucchini chips! I love anything made from an avacado and if you handed me a dozen I coyld eat theem all myself. I would love to make chicken or fries in one fo these.. I have to cook witj little or no oils sue to dietary restrictions ad this would be awesome. We love calamari, this sounds delicious! I would definitely want to try out the avocado fries! I love the idea of an air fryer, had no idea such a thing existed. Love the recipe, I'm a big calamari fan. I would love to make sweet potato fries and maybe some coconut shrimp. Thanks for a great giveaway! I would love to make healthy fries out of asparagus and green beans! Potato wedges, chicken wings and chicken livers is what I'd like to try to fry. Would love to have this I would fix a lot of vegetable in this……….. I would like to try onion rings and fried chicken! Loved the recipe too! I would try the Sriracha & Honey Tossed Calamari. Seriously sounds fantastic. I LOVE calamari, and sriracha is my one of my favorite flavors. This recipe, alone, makes me really want to try out this air fryer! I think I'd try homemade fries. Real fries need to be fried twice, which is what makes them so unhealthy, and so delicious! I'd love to try them in the air fryer! I think that the recipe sounds really good and easy too. If I won I think I would mainly make chicken or french fries in it! My son would love the Philly Cheesesteak Eggrolls. I think this would be perfect for my son and I. Being a teen he wants quick and easy. This would be perfect, safe and healthier for him. My two little girls LOVE some french fries, so I would cook a lot of fries, lol. I love the idea of french fries without all of that oil! I would like to make onion rings in this machine. I would cook onion rings! The calamari looks delicious. I'd really like to try the fried avocado. I showed my husband this recepie and now he wants to try it..
Well I'm allergic to calamari and avocado so they aren't for me 🙂 But I would love to fry some onion rings up yum yum! Fries would be at the top of my list to start with. Not a fan of avocado, but would love to try fries and onion rings. I like the Sriracha & Honey Tossed Calamari recipe! I would use it to make calamari. I would also use it for chicken and onion rings! I would make baked cream cheese wontons. I would make some air fried ravioli. I saw a recipe earlier this week that I'm really wanting to try. I would like to try out making some avocado fries with the air fryer. How about with Sweet garlic chile sauce?? ?